1.1.1. A statement of what type of work your company would like to perform at NCSU. Be specific. 1.1.2. Company’s legal name, address, telephone numbers (office and mobile), fax number, and email address. 1.1.3. One contact person for the company. 1.1.4. 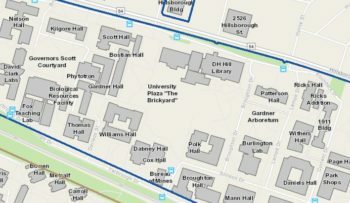 What is the distance, in miles, from your company’s address to main campus at NC State University? 1.1.5. List of company officers with title and telephone numbers (office and mobile). 1.1.7. Number of permanent employees, including a listing of position titles and the number of persons in each position (Ex: 3 Vice Presidents, 5 Superintendents, etc, 12 foremen, 7 machine operators, etc). 1.1.8. List of currently-owned vehicles and/or construction equipment. 1.2.1. Type of license (general, electrical, etc). 1.2.2. Dollar limitation of the license. 1.3. If your company is a corporation, then in addition to a contractor’s license, your corporation must be registered with the North Carolina Secretary of State. In-state corporations must present proof of registration via their Articles of Incorporation in North Carolina. Out-of-state corporations must obtain and present a “Certificate of Authority” from the Corporations Division of the NC Secretary of State, telephone 919-807-2225. 1.4. Federal tax identification number. 1.5. Copy of the company’s current certificate of insurance (liability, auto, workman’s compensation) from its current insurance carrier. See attached information for minimum coverage amounts at NC State University. 1.6. Copy of Certification Certificate as a Historically Underutilized Business, from the State of North Carolina Department of Administration (if applicable). 1.7. Work history along with references and letters of recommendation. A history of work at NC State, other universities, and other institutions is weighted heavily in decision making. References and letters of recommendation, likewise, carry additional weight beyond a work history. NC State will contact your references. 1.8.1. OSHA 200 Summary for the past three years. 1.8.2. OSHA Incidence and LWD (Lost Work Days) Rates from your insurance carrier. 1.8.3. Experience Modification Rate (EMR) from your insurance carrier. 1.8.4. A description of any OSHA citations in the past three years. 1.9. If you wish to bid on projects in the $100,000 to $500,000 range, a Statement of Bonding Capacity up to $550,000 from a Surety that is registered/licensed to conduct business in the State of North Carolina. (The additional $50,000 is to cover the possibility of unanticipated change orders above $500,000.). 1.10. (Optional) Consider including any brochures, pamphlets, notebooks, or other marketing products that you would like the review panel to consider. 2.1. NC law does not require advertisement of contracts under $500,000, which are defined as “Informal Contracts.” Furthermore, NC State entities are empowered to solicit contractors on an invitational basis. Therefore, NC State monitors existing contractor performance and evaluates new contractors who indicate interest, in order to determine the best contractors to conduct work at NC State. 2.2.1. A history of reasonable bid price submissions. 2.2.2. A work history that indicates specialization and quality of workmanship in a particular construction skill, including the extent to which the Contractor follows project specifications and drawings provided by NC State. 2.2.3. Degree of participation in the NC State bid process, i.e., demonstrating a high degree of attendance at pre-bid meetings and submitting viable, competitive bids when invited to bid. Contractor shows up for pre-bid walkthroughs after informing the project manager they will attend. 2.2.4. Contractor’s degree of quality control, i.e., identification and correction of deficient work or plan conflicts in a timely manner. Final inspections yield a minimal number punch list items, which are not significant. 2.2.5. Responsiveness to NC State project managers on a daily basis. 2.2.6. Decorum, conduct, and non-disruptiveness of contractor staff and subcontractors. 2.2.7. Cooperation with other contractors on the project and in the vicinity. 2.2.8. Degree to which Contractor is considerate of building occupants and the Construction Services project manager with regard to notification, scheduling, and coordination of operations that will cause noise, vibrations, dust, odors, safety concerns, and other activities that can potentially interrupt the normal conduct of business. 2.2.9. Ease of daily coordination. Courteous and cooperative nature. 2.2.10. Substantive proof that a responsible company representative will be on-site at the NC State campus within 1 (one) hour of notice from NC State, 24 hours a day, for safety or emergency issues. 2.2.11. Degree of NC State supervision and coordination necessary before, during, and after construction. Preferred contractors require minimal supervision or progress inspection. 2.2.12. Material submittals and delivery: Contractor diligently researches materials and vendors that meet specifications, ability to coordinate with designers on submittal issues, and ability to deliver materials to site in a timely manner. 2.2.13. Responsiveness to warranty issues. 2.2.14. Extent to which Contractor complies with NC State general conditions, parking policies, Hot work and other permit requirements, and other policies. 2.2.15. Safety consciousness on the job site. Demonstrated safety measures to protect students, employees, visitors, and workers. Existence of contractor safety plans and employee briefings. Maintaining a secured, safe site on a daily basis. Compliance with OSHA requirements. 2.2.16. Job site cleanliness during projects and upon leaving job sites. 2.2.17. Degree of familiarity with a particular building and its components, or specific knowledge of a particular client or organization’s needs. 2.2.20. Not exceeding license limitations. 2.2.21. Submission of change orders in timely fashion with adequate cost breakdowns. 2.2.22. Flexibility and cooperation when resolving delays. 2.2.23. A track record of timely project completion. 2.2.24. Ability to meet project schedule, given size of full-time staff and the ability to subcontract quickly. 2.2.25. Extent to which contractor requires subcontractors to conform to these parameters. 2.2.26. Work load at the time of a project solicitation. 2.2.27. Contractor’s technological capability, with regard to mobile telephone, email address, and fax machine. 2.2.28. Other qualitative or quantitative factors that may apply to particular situations. Contractors are generally invited to bid in groups of 5-8. Projects are bid on a rotating basis between qualified contractor groups, with allowances made for contractor substitution into bidding groups. Bid proposals are to include bid price as well as time required by the bidder for accomplishing the contract work, taking into consideration deadlines set for certain projects. 2.3. Contracts are usually awarded to the lowest responsible bidder based upon price and/or time proposed to accomplish the work, subject to individual circumstances. The following is a list of current construction specialty groups for which NC State maintains current contractor lists. Contractors wishing to be considered for work in a particular specialty area must request for the classification, in writing, to the Construction Services Department. One contractor may qualify to be classified in several specialty areas. All construction disciplines not listed in the Major Groups are considered to be “specialized” types of construction work. At NC State, these construction specialties are required less frequently than the major groups for which rotation pools are used. The list below provides several examples of these disciplines. In the case of specialized contractors, NC State reserves the right to directly solicit these contractors from various sources without regard to maintaining a rotation pool. These Instructions are subject to change without notice.